Mensusa https://www.mensusa.com/articles/navy-blue-chalk-suits-suits-with-classy-and-elegant-choices.html Navy Blue Chalk Suits- Suits For The Men With Classy And Elegant Choices Navy blue chalk suits are wonderful options to pick for making a classy and ravishing appearance. www.mensusa.com offers the best collection of suits and Striped dress pants. Stripe designs hold a significant place in fashion for the ravishing effects it adds to the attires. Choosing the perfect design and shade for the stripes for the suits, you can be assured to get a classy and stylish appearance. The pairing of the chalk suits with striped pants is a perfect example that can be cast in this regard. The stripe suits, in its blurred stripe design look ravishing and it can accentuate your appearance in a fashionable way. The pairing of the striped trousers with chalk suit is just similar to that of the red cherry on the delicious cake, each complementing the other. The market has the availability of chalk suits and striped trousers in various designs and shades and hence, getting some exotic combination would not be a tough deal to accomplish. Pick the design and colors of the suit and the trouser that fit with your physical attributes and persona and you are ready with the resources to make an impressive public appearance. The navy blue chalk suits would be a classy selection as it fits well on all sorts of complexions and you can wear the suit across the widest scopes of occasions and events. The chalk stripes, usually coming in shades of white or similar colors, looks exceptionally classy against the navy blue shade. Navy blue shades go wonderfully well in the daytime and the evening appearances alike. The shade is perfect for choice as formal attiring and the stripes would add grace and glamor to your appearance, for sure. You need to pair these exotic suits with appropriate choice of striped trousers and watch the magic it creates in the eyes and mind of the people around you, who are sure to appreciate your appearance. For the formal appearances, the combination between the navy blue chalk suits and striped dress pants would be a wonderful option to opt while dressing for the formal ambiances. You can rely on the exotic combination for the party dressing as well. The choice of the colors of the stripes would come important. You should ideally go for the similar shades or the contrast matching, both exclusive by its respective features. One thing which is common, irrespective of the shade you choose, is that it holds the potential to accentuate your appearance in the most gracious style. Get the suits and the trousers offering the perfect fitment and you are all set to make an appreciable and impacting appearance, no matter it is a professional or party ambiance. Pinstripe dress pants can do wonders if you pair it with the navy blue chalk suits appropriate. Pinstripes and chalk stripes are basically of the same category, each having its exclusive features. The pairing of the two variations combines the worthiness of the two and hence, it is as good as doubling the impressiveness. The pinstripe design for the trouser and the chalk pattern for the suit coat would complement and supplement each other wonderfully, getting you the best appearance. 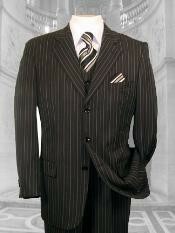 The black and white striped suit stands as the most classic number in the portfolio of the striped suits. This combination gives the illusion of the light-and-shadow effect on your appearance and hence, you can be assured that you would appear highly elegant and sophisticated. Attires like the navy blue chalk suits and the black-and-white stripe stands as universal and relevant over the ever-changing domain of fashion. No matter you require a formal or casual appearance, these suits would equally ravishing as the choice of the attire. Similarly, you can opt for these classy attires for the daytime as well as the evening occasions alike. It is important to say that, you need not to be concerned about your skin tone while picking these suits as it fits well on all sorts of complexions. Likewise, you would be able to pair the widest shades for the accessories as well. Hence, opting for these classic and elegant suits, you are getting the most wonderful solution to your quest for stylish yet sophisticated attiring. www.mensusa.com offers the most ravishing options on chalk suits and dress pants online.